I love Exorcist II: The Heretic. There, I said it. It’s liberating. I have voiced the most shameful secret any horror fan could harbor. I and others like me can now march in the streets with our locust flags flying high, in pride. I adore this loony, insane, beautiful mess. And a mess it is. Universally reviled, considered one of the biggest turkeys in cinema, Heretic holds up for me as an unintentional comedy and as a weird, original, meta-philosophical bit of art house cinema. It is the perfect example of the 1970’s excesses of visionary egomaniacs with relative carte blanche to make vanity masterpieces, or disasters. And guess what? I think modern cinema is poorer for not having this. I’m sure the people abused by coked-out psychos like Friedkin, Scorsese et al disagree, with good cause. This is my moral failing. John Boorman is one of my favorite directors. His films are epic clashes of nature, macho shamanism and survival. You’ll find very little that’s cookie-cutter in his work, from Point Blank to Deliverance to Zardoz (oh, Zardoz!) to the Tailor of Panama. Playwright William Goodhart was commissioned to write the screenplay, titled The Heretic, and based it around the theories of Pierre Teilhard de Chardin (the Jesuit paleontologist/archaeologist who inspired the character of Father Merrin when Blatty wrote The Exorcist). Goodhart’s screenplay took a more metaphysical and intellectual approach compared to the original film. The end result was a bizarre fever dream or tone poem, if you like. With locusts. I’m typically too lazy to do plot recaps. They’re tedious and I hate them. But this film is special, and I feel duty bound to take you through it. Needless to say, SPOILERS follow. We open with an interesting scene featuring Father Philip Lamont (Richard Burton) performing an exorcism on a woman in South America. The possessed woman snaps back to herself for a minute to say “Por que yo? Por que? Why me? I heal the sick!” Then the demon takes control again and sets her drapey fire hazard of a dress alight. This scene is actually important. Cut to New York City. We are reintroduced to Regan MacNeil (Linda Blair), now 17 and living in the New York of 1977 (cool!). Regan lives in a swanky – and safety-code violating – avant-garde apartment building which is actually Warner Brothers’ then-NYC base. Her mom, Chris MacNeil, is currently “on location in Europe,” which is code for “Ellen Burstyn wanted no part of this film.” Tutoring and watching over her is Sharon, the nanny from the original Exorcist, reprised by actress Kitty Wynn, whose story arc will take a creepy and campytragic turn. 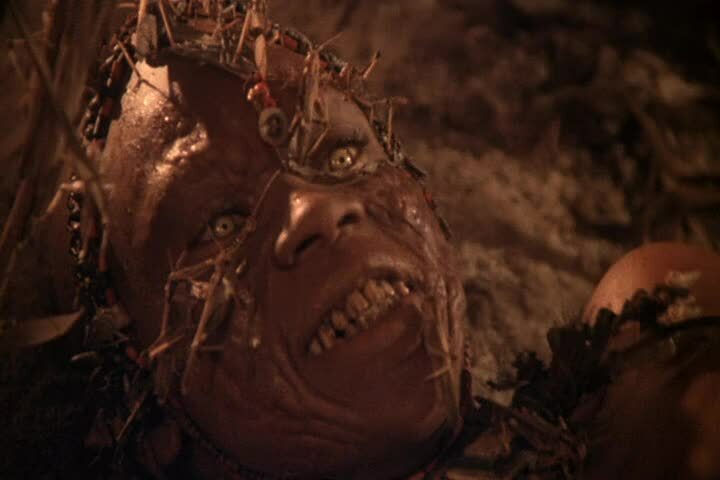 It should be said that Linda Blair is radiant and lovely in this film. Reportedly her life began its downward spiral at around this time. But she presents as charming, likable and innocent as her pre-possessed younger self in The Exorcist. This is not to say that her acting wasn’t bad and spacey, nor that she wasn’t given some amazingly ludicrous dialogue. Regan claims she doesn’t remember “that time in Georgetown,” only that she was very ill. But she’s troubled by strange dreams. So she visits regularly with psychiatrist Dr. Gene Tuskin, played by Academy Award winner Louise Fletcher in another of many creepy-spacey performances within this movie. More avant-garde interior design: Dr. Tuskin runs a pediatric psychiatric clinic that is a weird, cool labyrinth of see-through glass – surely violating a HIPAA law or two. More importantly, Dr. Tuskin treats her patients with bizarre junk science contraptions such as The Synchronizer, which hypnotizes doctor and patient into sharing the same vision/dream/memory (pictured at the beginning of this section). Back to Fr. Lamont. The Vatican wants him to investigate Lancaster Merrin’s death from Regan’s exorcism, to see if he was either a saint or, well, a heretic. He travels to New York to meet Regan. After they use Dr. Tuskin’s scientology e-meter synchronizer, telepathic wackiness ensues. Essentially, not only do Regan and Fr. Lamont develop a psychic link, but they also share dreams of a young African boy named Kokumo, the subject of the exorcism in Africa that nearly killed Fr. Merrin (as was mentioned in The Exorcist when Fr. Merrin was introduced). And ultimately, they all become linked to …. PAZUZU! Heeeeeeehhhh! (a.k.a, the demon that possessed Regan all those years ago). Long story short, the mystic vision quests lead to: a trip to Africa for a meeting with the adult Kokumo (James Earl Jones), who at turns is either in a leopard costume, a locust costume (“looking like a drag queen at Mardi Gras!” I seem to recall Joe Bob Briggs exclaiming) or as a Western scientist; an intense Coptic Christian ceremony; an evil tap dance number; a sleazy Times Square motel followed by a philosophical telepathic discussion; a race to Washington D.C. that is so boring, pointless and full of bizarre asides that it actually entertains anyone with endurance and tolerance for the weird; two quasi-possessions, and a befuddling final battle in the Georgetown house where it all began. In the midst of this acid trip we learn that Regan, Kokumo and the Latin American woman were targeted by demons because they were “special” – they were psychics and healers and spiritual leaders with the potential to turn the tide of humanity’s spiritual consciousness towards “good,” away from where Pazuzu and its cohorts want the world to go. Note (and major spoiler): the original cut of the film ends with Regan and Fr. Lamont walking off into the sunset to – fight evil, I guess? Upon the near-riots that the film inspired in early showings, Boorman cut a different ending which ended with Lamont apparently falling into hell. How that made things any better, I just don’t know. My own history with the film: too disturbed by the original, I could only watch bits and pieces of it as a tween. But what I did watch oddly enough held my attention and scared me at parts. Cut to my mid-20’s, when my appreciation for bad psychotronic films was blossoming. None other than the great Joe Bob Briggs, host of “Monstervision,” screened Heretic on TNT. And after that night, I gained a fond appreciation for, and obsession with, the film that I share with one of my oldest and dearest friends. Don’t be fooled by his redneck act or his sophomoric Drive In Totals. Joe Bob Briggs is witty and he can bring sophisticated insights into cinema. He knew a lot of interesting tidbits about the film. He led me down the path of enjoying it as a comedy and as an art house film. There’s no ignoring the fact that this film draws plenty of unintentional laughs. Bad dialogue, bad acting, and long boring nonsensical segments only add to its wonderful effect. You won’t just hear that from me. It’s pretty much all in this video, and although I would love anyone reading this to watch the full movie, if you just want Exorcist II: The Comedy, click on the link. You’re welcome. Where to start? Perhaps in Richard Burton’s unbelievably hamfisted acting? It’s not just one or two instances. His whole presence throughout the film looks like a vodka induced stupor. See the link above. Or in certain lines of dialogue. Say, Regan explaining to a little girl she just cured of autism with her newfound mystic power why she was in the mental treatment facility. Or, in Sharon turning to Father Lamont for spiritual and psychological guidance? In an exposition that’s simultaneously creepy (in the context of the first film) and ridiculous, Sharon explains to Lamont that she stayed away from the McNeil family, but then found that the only time she was “at peace” was when she was around Regan. When she then asks Lamont why that would be, Richard Burton replies, “have you tried talking to a priest, or a psychologist?” Sharon’s reply: “I’m talking to one now, aren’t I?? ?” Helloooooo! Still don’t see the unintentional humor? 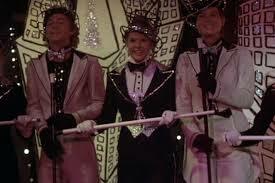 Then how about Regan’s tap-dancing Lullaby of Broadway number (see the clip above at 3:11)? Let’s not forget the villain of the piece; the demon Pazuzu. You can find out more about this Assyrian deity here, represented by the terrifying statue seen in The Exorcist. I was certainly disturbed by it for years (see my piece on the first movie). 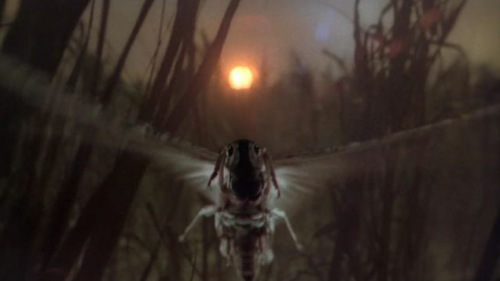 In Boorman’s interpretation, the vicious demon that possessed Linda Blair in the first film was … a locust. A Bad Locust. THE Bad Locust. A locust that warbles and shrieks like Yoko Ono on amphetamines while flying through the air terrorizing African villages. Until of course, it’s stopped in it’s tracks by James Earl Jones spitting a leopard at it. 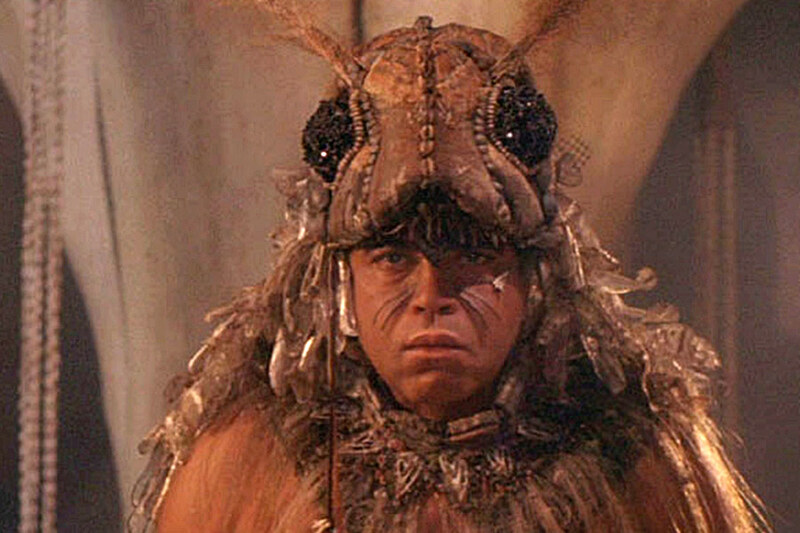 But let’s also not forget Mr. Jones’s epic giant locust costume. There is so much more that’s unintentionally funny and ridiculous throughout the movie. It takes a special person to love the bizarre, long journey from New York to D.C. for the finale. Sane people with a life usually turn the film off by this point. Not I. Its sheer dullness, its pointless asides (accidents, fighting with cabbies and Amtrak officials) added to the comedy quotient, but only because it intensified the surreal mess that is this film. 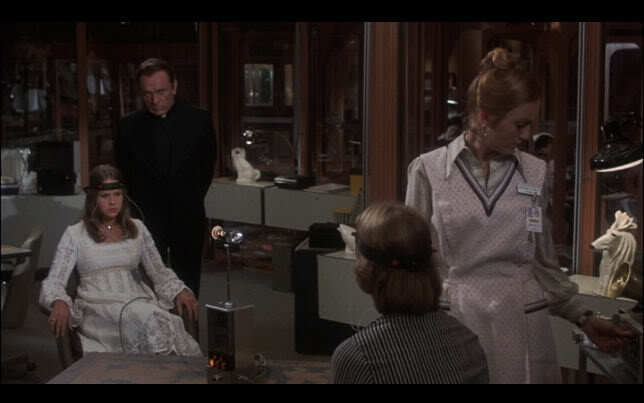 There’s nothing like Exorcist II: The Heretic. It might be bad, but it’s amazingly epic and original in it’s badness. You’ve never seen anything as creative as this. And it is creative; I defy you to tell me otherwise. I realize this undoes, and is inferior to, the very heart of William Peter Blatty’s novel and William Friedkin’s movie. Regan’s possession was a test for the two priests. It happened because that demon wanted to twist innocence and love into something unbelievably ugly and unbelievably emotionally devastating. And this was subtly and masterfully presented in the movie. And if you can’t simply divorce the first film from the world that Heretic lives in, it will rightfully bother you. So just take this film on its own. If you need to, pretend it’s an alternate, parallel universe of some sort, like in a DC Comic. And then you have a unique film about a “war” between good and evil. But one that doesn’t play out like some kind of superhero fight or Lord of the Rings epic battle. Regan/”Pazuzu’s Regan.” Kokumo scientist/Kokumo shaman. The war plays out in a bizarre incoherent tone poem and weird mystic symbolic dualisms. Interesting and original mumbo jumbo nonsense. And more: it may seem Manichaean and simplistic, but why do these good psychic saints have such a visible flip side? There are some shamanic ritual practices that involve the shaman taking a patient’s sickness, illness or negative condition into him or herself, and then releasing it (perhaps spitting out a stone or root). 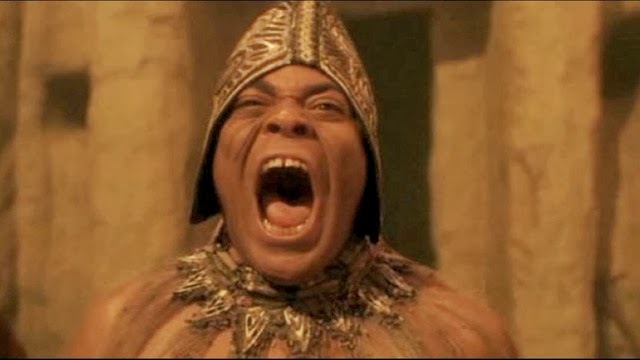 The way that James Earl Jones spits out that red gumball, or dresses up as Pazuzu (AWESOME!). At some point, does the healer or positive spiritual leader have to take in the evil, manifest it, experience it? Does that leave them stronger, immune, ready for the continuing fight? Speaking of tones, Ennio Morricone’s soundtrack is incredible. The brew of tribal and liturgical music, acid rock, Yoko Ono demonic shrieking and the beautiful “Regan’s theme” speaks for itself. And the cinematography is just amazing. I’m terrible at writing about it, but the colors, the painted sets, the Africa dream sequences, the shot compositions are outstanding. A sequence that I cannot find image nor video of involves a treacherous climb to an Ethiopian rock church, where Fr. Merrin and some Ethiopian Christians have to take a rabid, possessed young Kokumo in a harness. The moment one of the Christians plummets to his doom, the possessed boy turns to the camera and smiles a chilling, evil smile. My words don’t do it justice. And now, I’m going to add a recently realized reading that I took away from Heretic, which I will adapt from a comment I made on the excellent blog It’s Just Playing, But With Research, where academic CarrieLynn D. Reinhard documents her analysis of exorcism cinema. “Now then: dare I offer a somewhat radical take on it? I think Heretic intentionally or not could be speaking to Third World liberation theology. Because let’s face it, Father Lamont – perhaps only by virtue of Burton’s hilariously bombastic buffoonish acting here – was utterly useless and incompetent. AND, he was was corruptible, he was arguably the Possessed, right down to his making out with “Pazuzu’s Regan”. He was the titular Heretic for sure. As the agent of the Roman Catholic Church (read Western theology/spirituality) he failed completely to combat Pazuzu (unless one feels his “tearing out her evil heart” was his triumph, but I read it as Regan’s triumph, her exorcism of Fr. Lamont). Meanwhile, who has the TRUE spiritual power here? Regan. Kokumo. The Latin American healer woman (whom Lamont/The Church failed to save). African spirituality sent Pazuzu packing! Even Kokumo’s first exorcism – yes Father Merrin presided over it, and it was a Christian ritual – but it was a COPTIC Christian ritual, outside of white European Christianity. Third World people possess the key to their own spiritual salvation. The Copts even rejected Lamont as a devil-worshipper, and to me that’s a indicative of a rejection against colonialism, even the spiritual colonialism of a very, very ineffective Western Catholic Church. Perhaps similarly, Dr. Tuskin as a woman of Western science failed both Regan and Sharon. And Kokumo had a dual role as both Shaman and umm, locust researcher (i.e. man of science). And he again revealed the key to defeating Pazuzu (‘The GOOD locust’). A duality and synchretism of mysticism and science, Pierre Tailhard du Chardin and the world-mind – all interesting things to consider and unravel here. [T]he more I think about it, the more I’m coming to the conclusion that Regan/Kokumo was the Exorcist here. Perhaps there’s a patriarchal message in that she had to channel Kokumo in order to break Pazuzu’s hold on Lamont, but still, western Christianity just didn’t achieve much. Even Merrin’s sainthood – which was Lamont’s primary mission in the beginning – was quickly forgotten when we find out that Regan is a potent spiritual force on her own. I’ve unpacked it all now. I love Exorcist II: The Heretic. And while it’s never better than The Exorcist, Exorcist III: Legion and arguably Dominion: A Prequel to the Exorcist, it’s a damn beautiful, fascinating, thought-provoking and hilarious mess. It’s MY mess and I stand by it. FIVE FULL STARS. That’s right. Have at thee, commenters. Pauline Kael and Martin Scorsese have my back.